It’s that time of year again when we reveal our toes that have been hidden away all winter under our boots and brogues to the general public. Are your feet ready? We always suggest a good pedicure even before trying on sandals as you want your feet to look their best. It’s the same thing as going shopping shopping on a bad hair day, when nothing seems to look good. Once your toes are painted you’re ready to try on some of the gorgeous sandals gracing the stores this summer. This post is dedicated to flat jewelled sandals in particular as these graced the catwalks at the beginning of the year and now they’re everywhere from high street to designer. 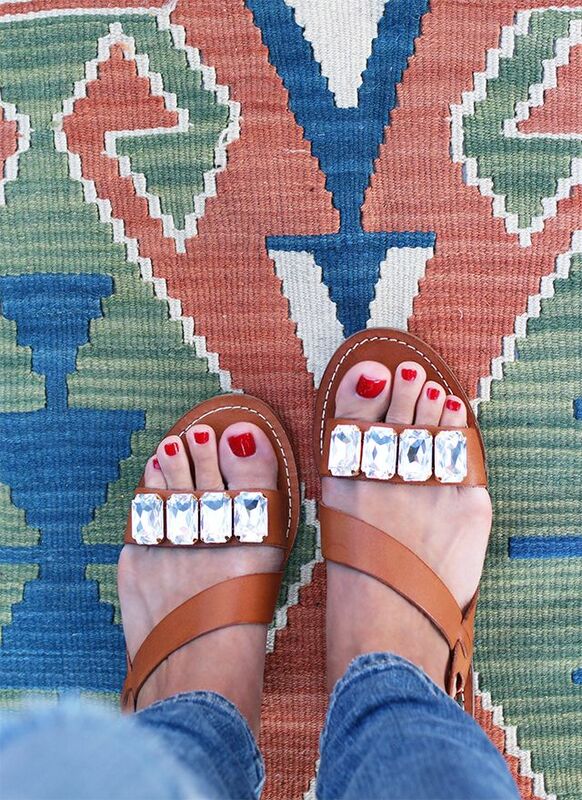 Jewelled sandals are a great way of dressing up an outfit without having to wear a high heel. These come in array of different shapes and colours ranging from one jewel to some sandals totally covered in jewels. These are a great variation on ballet pumps and can just as easily be worn with a pair of your favourite jeans and with an evening dress. These are a few of our favourites available on the high street now.